The results of hair transplant surgery will take several months to become apparent. While patients may be anxious about the overall outcomes of the procedure, a little patience is necessary. The final results of hair loss treatment are worth the wait. Dr. Robert True and Dr. Robert Dorin have helped countless patients at their New York, NY hair restoration center. Let’s take a look at the monthly hair growth schedule after hair transplants have been placed. This covers the general hair growth schedule for both FUE (follicular unit extraction) and FUT (follicular unit transplantation) patients. About two months after hair restoration surgery, some patients may experience a case of temporary hair loss known as telogen effluvium. This is a natural response of the hair follicles to shock such as a surgical procedure. While the results of your hair restoration may seem impacted, remember that this response is normal and the issue will resolve on its own in the coming months. If a patient does not experience telogen effluvium, they should experience the first hair growth of the transplanted follicles around the third months after surgery. Some patients may notice hair growth sooner, while others may notice the hair growth a bit later. 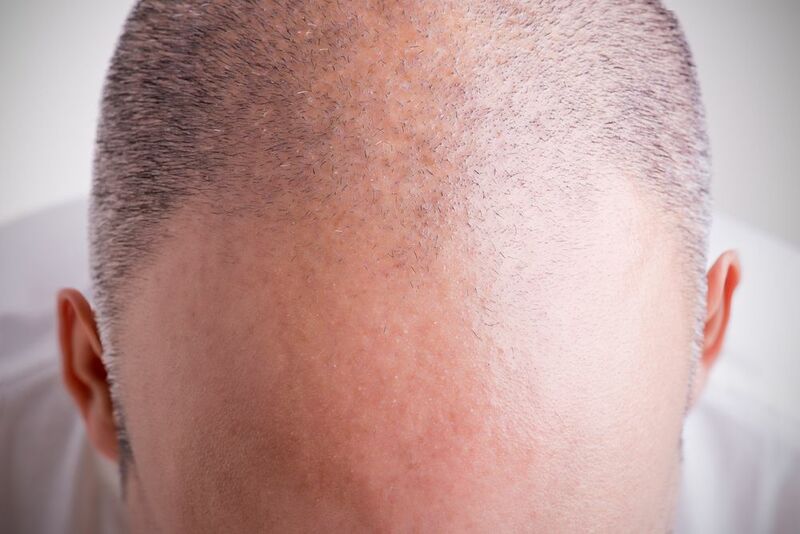 These initial hairs from the hair graft tend to be lighter and thinner than your hair in the donor area. Do not be discouraged, though. This is a sign that the transplanted follicles are healthy and are growing normally. In the next few months, the thickness and quality of the hair will improve. Around the half-year mark following surgery, your hair growth should be much steadier, with the hair quality improved. Do not expect these to be the final results of your hair transplant, however. Your hair growth and hair quality will continue to improve over the next six months. By the eight-month mark, patients should notice considerably thicker hair and good overall hair density. This will be an indication of what the final results of the hair restoration will look like. Some patients may achieve final results around this eight-month mark, requiring no additional follow-ups from their hair surgeon. By the end of a year, a hair restoration patient should achieve full hair density and overall hair growth. The effects of telogen effluvium will have passed, and issues with density will have been resolved. At various stages of recovery, patients will visit their hair restoration surgeon to have their progress checked on. This will allow the hair restoration specialist to note any issues that arise and make suggestions that could improve the final outcomes of surgery. Attend all of these additional visits as scheduled to help ensure success. For more information about hair restoration surgery, be sure to contact our team of hair transplant surgeons. Our practice can also be reached by calling (212) 826-2525. We’re here to answers your questions and address your concerns about hair loss and your treatment options.